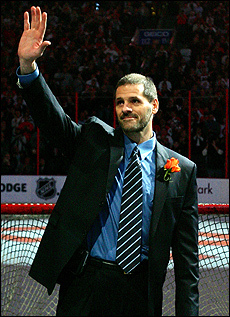 (Philadelphia, PA) – Ron Hextall became the 19th member of the organization to be inducted into the Flyers Hall of Fame in an on-ice ceremony at the Wachovia Center during Wednesday night's Flyers-Washington Capitals game. Hextall, 43, appeared in 489 regular season games during his 11-year Flyers career (1986-87 through 1991-92 and 1994-95 through 1998-99 seasons), posting a 240-172-58 record and 2.91 goals-against average. His 489 games played and 240 wins as a Flyer rank him first all-time in Flyers history. In 84 playoff games for the Flyers, Hextall registered a 45-36 record and 2.95 GAA. His 45 playoff wins are the most in Flyers history. As a rookie during the 1986-87 season, Hextall posted a 37-21-6 record, 2.52 GAA and one shutout in 66 regular season games. He led the NHL in games played (66), wins (37) and minutes played (3,799). He compiled a 15-11 record, 2.77 GAA and two shutouts in 26 playoff games as the Flyers advanced to the 1987 Stanley Cup Finals. He was named to the NHL All-Rookie Team and NHL First All-Star Team for the 1986-87 season. In addition, he won the Vezina Trophy as “the goaltender adjudged to be the best at his position” and the Conn Smythe Trophy as “the most valuable player for his team in the playoffs”. The 1986-87 season was the first of five seasons that Hextall recorded 30 or more wins (only goaltender in Flyers history to post five 30-win seasons - 1986-87, 1987-88, 1988-89, 1995-96 and 1996-97). On December 8, 1987, Hextall became the first NHL goalie to score a goal by shooting the puck into the opposing net as the Flyers defeated the Boston Bruins at the Spectrum, 5-2. He repeated the feat when he became the first goalie to record a playoff goal as the Flyers defeated the Washington Capitals at the Capital Centre in Game Five of the Patrick Division Semifinals, 8-5, on April 11, 1989. He was traded by Flyers, along with Steve Duchesne, Peter Forsberg, Kerry Huffman, Mike Ricci, a first round pick in the 1993 NHL Entry Draft, $15 million and future considerations (Chris Simon and a first round pick in 1994 NHL Entry Draft) to the Quebec Nordiques in exchange for Eric Lindros on June 30, 1992. After two seasons with Quebec (1992-93) and the New York Islanders (1993-94), he was traded by the Islanders, along with a sixth round pick in the 1995 NHL Entry Draft, to the Flyers in exchange for Tommy Soderstrom on September 22, 1994. Over the final five seasons of his career (1994-95 through 1998-99), Hextall posted two 30-win seasons (31 in 1995-96 and 31 in 1996-97), led the NHL in GAA (2.17 GAA in 1995-96) and helped the Flyers to the 1997 Stanley Cup Finals. He still holds team records for most penalty minutes by a goaltender in one season (113 in 1988-89) and most points by a goaltender in one season (8 in 1988-89). The Flyers Hall of Fame was established in 1988 to permanently honor those individuals who have contributed to the franchise’s success. The Hall of Fame induction is held, as needed, with candidates nominated and voted upon by a panel of media members and team officials.